Given where I was headed, I had told myself that the camera would be a definite no-go. So it stayed behind in the hotel room. At the gate of the establishment I needed to be in, off went my cell phone and bag as well. They had to be surrendered. I was allowed to proceed like a scribe from journalism’s early days – two writing pads and two pens clutched in my hand for pursuit of profession. I liked that situation. It restored purity and simplicity. Like early morning run; time with oneself and nothing else before world by restless cell phone, breathless TV, exploding traffic and a thousand expectations take over. “ Careful,’’ Siddesha Hanumantappa said as I almost fell onto a nearby patch of carefully manicured green thanks to my shin splint of a leg giving away. We were at the Aeronautical Development Agency (ADA) in Bengaluru. Siddesha found a quiet conference room for the interview he had promised. Nelamangala is a town in Bengaluru rural district. It is around 25 kilometers away from Karnataka’s capital city, towards Tumkur. This is where Siddesha was born in March 1959, one of nine siblings. His mother who was illiterate stayed a housewife. His father managed a job in the police for a while, then, he resigned and commenced a business in Nelamangala. The income generated was barely sufficient to support the family. “ Of the nine siblings, six survive. Now I am the youngest,’’ Siddesha said. Educated at a government school, he studied in Kannada medium up to the eighth standard. “ From fifth onward, I learnt English. I moved to English medium when I was in the eighth standard,’’ he said. Twelfth standard was a turning point for young Siddesha. His father, who had supported the family, passed away. His mother struggled to keep things going. Siddesha therefore decided to work. In May 1978, an opportunity emerged to join the Indian Air Force (IAF). He grabbed it. After initial training in Bengaluru, he was posted to Lucknow. There an incident happened that altered his fortunes in life. A colleague wished to desert the IAF and while doing so, he left the books he had purchased to do an engineering course, with Siddesha. It sparked an idea – why not study engineering? The IAF provided perfect room for continuing education. Alongside his regular work, Siddesha enlisted to study electrical engineering from Institution of Engineers, Kolkata. He was a dedicated student. He finished the AMIE engineering course in two and a half years. “ I gave my first exam in May 1980, the last one in December 1982,’’ he said. Next, he enlisted for M. Tech at Harcourt Butler Technical Institute (HBTI), Kanpur. He was about to finish his first semester, when he got an offer from Hindustan Aeronautics Limited (HAL) to work at their Engine Division. “ Following my selection by HAL, IAF allowed me to leave,’’ Siddesha said. He joined HAL in March 1985. Two years later, seeking a change of scene, he shifted to ADA, a premier institution just established by the Government of India to design and develop the Light Combat Aircraft (LCA). “ I am one of the oldest employees of ADA,’’ he said. In his days at school decades ago, Siddesha was an active individual. He participated in any sport that entailed running. Football, kho-kho and kabaddi were his favorites. “ It wasn’t anything competitive; it was more of staying active,’’ he said. Things changed when he joined the IAF; the most significant shift perhaps being the early onset of responsibility given his father was no more by then. The young man needed to find a trajectory to move up in life. Despite the military being popularly associated with physical activity, Siddesha’s IAF days were quite different. Coming across those engineering books had rekindled the desire to study and with his joining the engineering course and completing it double quick in two and a half years, most days were spent studying. “ I would work eight hours and study up to twelve hours a day,’’ he said. During exam time, study hours increased further. Sleep wasn’t much. “ If I take up something, I become very serious about it,’’ Siddesha said. It was a trait that would show up in his running too. While he had all along been a sports loving person, it wasn’t until September 13, 1994 (he recalls the exact date) that running as the running it is these days for most of us, visited him. That day his wife who is an agricultural scientist and senior professor, went on outstation duty. The couple’s son, who was in nursery, was set to have an internal exam. Meanwhile, design work at office had also peaked leaving Siddesha a tired, exhausted man by the time he got home. “ The routine was to go home tired, eat and crash out,’’ he said. As alternative, he decided to seek time in the morning to spend with his son for his studies. Doing so, they woke up early and went for walk / jog together from 5.30 AM to 7.30 AM, from home to Cubbon Park and back. During this peaceful, private time, Siddesha, who would have prepared notes the previous night, taught his son what he required to know for his exams at school. The family stayed near Cubbon Park in Bengaluru. This early morning routine went on for a few years. As the days went by, the walking inched towards a mix of jogging and running. Siddesha’s son became fond of cricket. He ended up training at the Brijesh Patel Cricket Academy in 1998. When that happened, Siddesha’s daughter stepped in to fill the vacancy in the early morning walks. In due course she got selected to represent Karnataka in field hockey at the sub-junior level; she went on to play for the state at senior level too. According to Siddesha the drift to running from walking / jogging, happened mainly because of his fancy for return on investment. Running gave back much more than walking did. Even if he was teaching his children, he could jog or run alongside. “ Luckily my son and daughter were game to join me on those early morning walks. That was my biggest strength,’’ he said. From 2005 onward, with his children having made their own choice in sport, Siddesha started running solo. He would run from home to Cubbon Park and back. The distance run used to be six kilometers initially; that progressively increased to nine kilometers by 2009. Siddesha’s commitment to running is absolute. He runs every day no matter what. If he doesn’t run, he said, he felt his day gets spoilt; the body becomes too stiff and lethargic. A day after I met him, he was due to travel on work; catch a flight at 6 AM. He said he would make sure he got up at 1.30 AM and log in his daily run. “ I can sleep in the aircraft. Sleep is not a priority. In my case, whatever sleep I put in, it is deep sleep’’ he said, adding he didn’t need an alarm to wake up at the hour he wished to. For his weekly long run, which starts at 4 AM, he wakes up at 2.30 AM. He ensures he warms up before the run and cools down after it. In 2010, 2011, 2012 and 2013 he used to additionally cycle up to 70-80 kilometers per week. But that old obsession with return on investment saw him revert to full time running for it felt like more calories burnt per unit of effort. “ End of the day I am looking for returns and certainly, that feeling called runner’s high. Cycling is side dish. Main course is running,’’ he said. Siddesha does not follow any popularly tracked training protocols. He has designed his regimen himself. “ Basically, your joints should be working well and for endurance, you need a strong core,’’ he said. From September 2009 to February-March 2010, for seven days a week, he ran 30 kilometers every day. Then he got fatigued and reduced it to 22 kilometers for about nine months. Tweaking it further, he reached the norm of about 100 kilometers per week. Over two days in a week therein, he does a long run and a medium run totaling 50 kilometers. The balance 50 kilometers from the total of 100 kilometers is spread across the remaining days of the week. “Nowadays I run a minimum of 100 kilometers per week. At times it has gone up to 150-160 kilometers a week,’’ he said. Siddesha likes the fact that he is designing his passage through running himself. There is an element of science in listening to one’s body and making the required adjustments to keep running. Early morning, his hours spent running are an oasis of peace during which, he consciously manages the activity and strategizes for the day ahead. 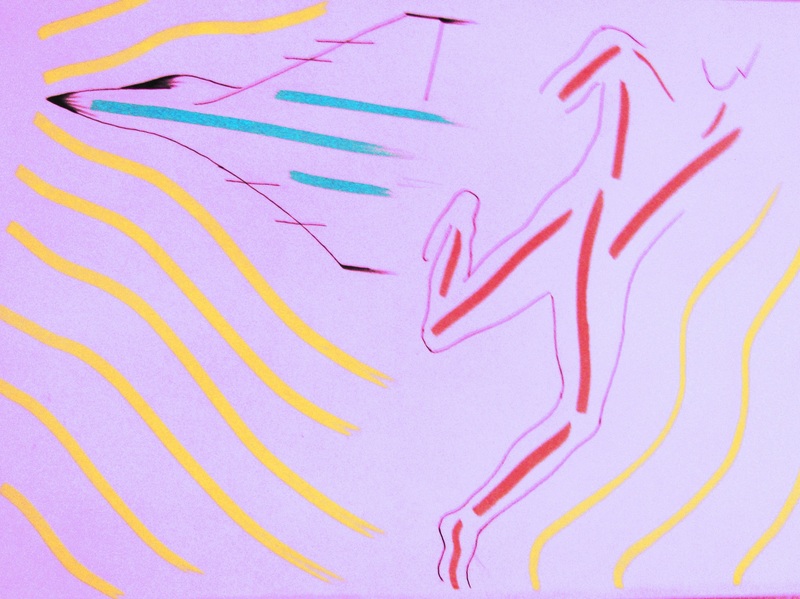 In some vague fashion, this private time spent running with the body sensing the challenges it is pushed into, it sending messages to the brain and the brain processing the data and transmitting instructions, harks of modern aircraft technology. Many fighter aircraft, including India’s LCA, work on digital fly by wire technology. A team of computers instantly analyzes control inputs made by a pilot, evaluating the aircraft’s speed, weight, atmospheric conditions and other variables, arriving at the optimum control deflections to achieve what the pilot has requested – this is how NASA’s page on the subject describes fly-by-wire. Multiple computers eliminate the possibility of computer failure and many computers participating in the voting exercise to decide, means an optimum decision made. From a design standpoint, there is an interesting paradox here. In the earlier days of aircraft evolution, emphasis was on creating a stable aircraft. However a stable aircraft means difficulty in complex aerial maneuvers, most of which are an invitation for instability. With fly-by-wire, it doesn’t matter if the aircraft is unstable. The resultant superior maneuverability promised is delivered by unstable aircraft using multiple computers for doing the real time math to meet pilot’s request. It reduces the pilot’s workload with respect to flying and allows him to concentrate on his mission. This is what makes fly by wire aircraft versatile. The personal time one finds while running, Siddesha felt, is somewhere similar to this. The body as stable platform is something we make it by conditioning it to only limited circumstances. Like in aircraft, that conditioning reduces its maneuverability in dynamic environment. As we challenge the body and it becomes unstable, the brain and its network of neurons and nerves engage furiously to make the body adapt and perform in altered conditions. Did you fly by wire today? – might as well be another way to ask: did you go for a run? That said Siddesha is clear that running is not all about pushing one’s limits. For example, after the 2010 Kaveri Trail Marathon, he participated in the Bengaluru Ultra completing its 50 kilometer-category. He didn’t enjoy it and chooses to see distances beyond the full marathon as probably not his cup of tea. The full marathon distance is his sweet spot in running. “ After 33-35 kilometers in a marathon I am really tired and hit a wall. From 35-36 kilometers onward, all hell breaks loose. That is where I enjoy the most,’’ he said laughing. 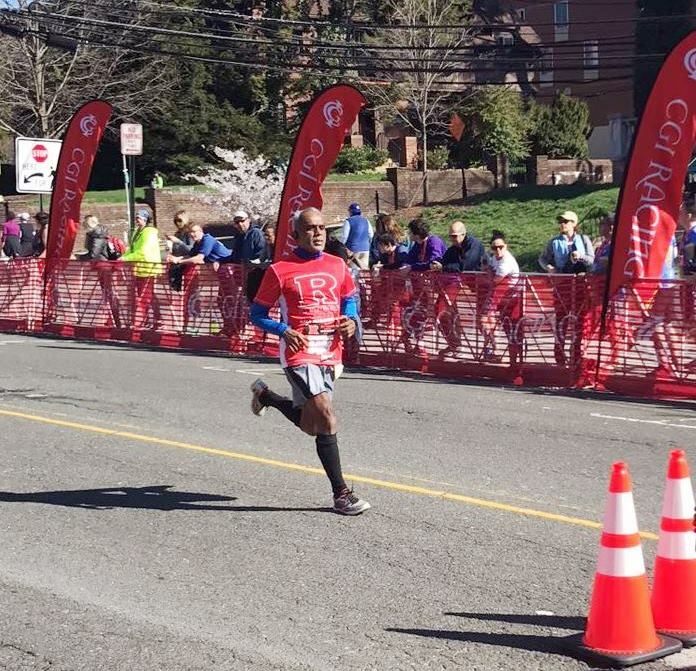 In April 2016 and 2017, Siddesha was among those who travelled from India to the US to run the Boston Marathon. “ It was not something planned, It just happened,’’ he said attributing the participation to the Boston Qualifier time he returned at the 2015 Standard Chartered Mumbai Marathon (SCMM), where he had finished first in his age category. 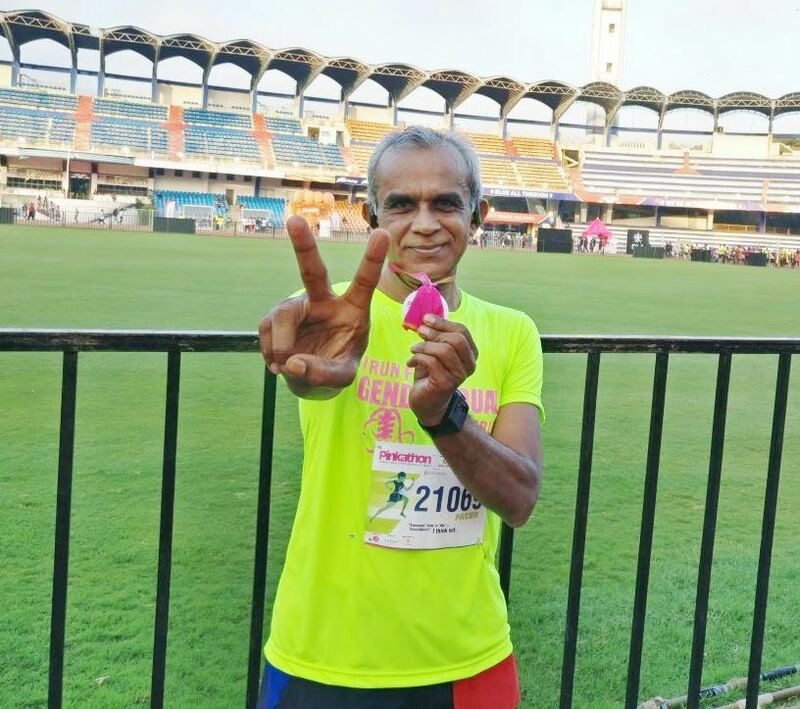 He had completed the Mumbai race in 3:29. Training systematically and doing it enjoyably, he reserves his best for events. His personal best so far in the full marathon was 3:24, clocked at an event in Delhi in February 2017. “ I am always content with whatever is my performance. I keep modest targets. That helps me enjoy my running. In running, you should not be over ambitious,’’ he said. At ADA, Siddesha Hanumantappa is Project Director (LCA-Mark 2) and Technology Director (Propulsion). “ I maybe a scientist by profession but running is my first choice,’’ he said.